I didn't have any trouble figuring out what "H" is for. I've just had trouble sitting down to write this post. I think I've mentioned on here before that Connor is wanting his Eagle Project to be something that helps to alleviate (in some small way) the problems of rural hunger. It certainly isn't that hunger isn't an issue in urban environments, but there are so many more resources available in the city. Out in rural America, people have a harder time finding help. But that isn't really the point of this post. I'm planning to do a little series in May. And it relates to hunger too, but on a more personal level. Five Days of Living out of my Pantry. Not like I have all the answers, or anything. But I do know that at times I will nonchalantly comment about how we've got a $15 grocery budget fort the week and people assume we are starving. I know that is definitely not the case. So clearly, what I think is normal might not be. Which means I'm going to try to blog about it just a bit. I'm considering cutting our grocery budget to something in the range of $25 per week for the next few weeks, and writing up weekly blog posts about what we eat. Or maybe having a $0 grocery budget for a week, and blogging about it day by day. Or trying to figure out what it actually is that I do that is different than the norm, and blogging about it. But that is harder to wrap my brain around. Because, naturally, I think I'm normal. So how do you think I ought to tackle this subject? Because I do think one step in dealing with the issues of hunger is for individuals -- for families -- to learn and grow and be more prepared to deal with whatever comes along. A well-stocked pantry being at least one little part of that. I know it is often said that most people are a single paycheck away from some pretty serious financial problems. Could you go a month without groceries? Or a week? I know we could. Because we have. Go, check out Marcy's blog, where other people have posted about far more upbeat H things like hope, Hershey's kisses and helping hands!! Anyway, I look forward to reading these posts. Let me know when you do it as I don't get to come over here as often as I like. I look forward to your 5 days series. I'd like to pick up some tips so that our normal starts to look more like your normal. I often cringe at the total at the grocery store. 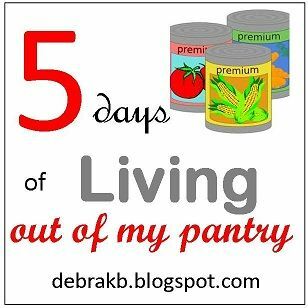 I am really looking forward to Five Days of Living Out of My Pantry! You inspire me. Seriously, $15! And that even though your family is roughly the same size as mine.... I obviously have a lot I could learn.